An advanced master trainer course of the Certified Train-The-Trainer Program, 5 Days intensive training followed by 4 months of internship. 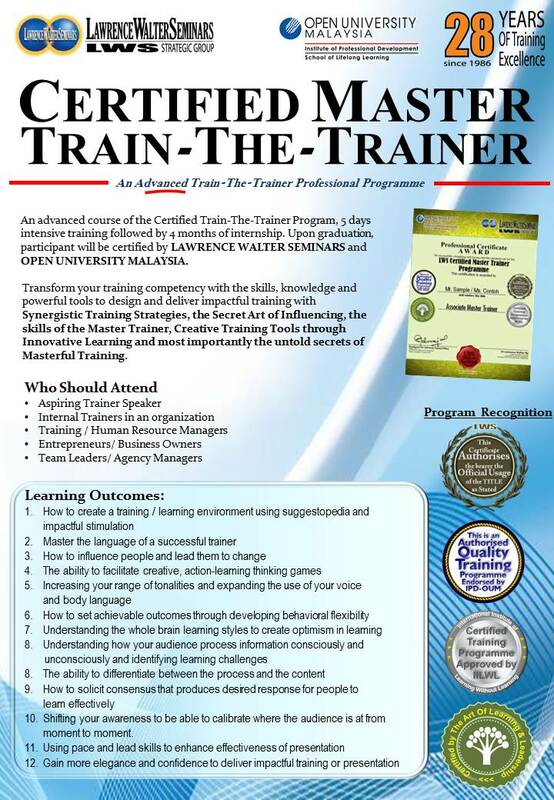 Upon graduation, participant will be certified by LAWRENCE WALTER SEMINARS and OPEN UNIVERSITY MALAYSIA. 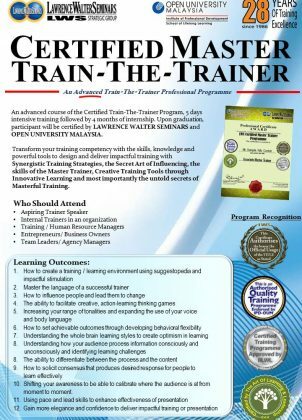 Transform your training competency with the skills, knowledge and powerful tools to design and deliver impactful training with Synergistic Training Strategies, the Secret Art of Influencing, the skills of the Master Trainer through motivational seminar, Creative Training Tools through Innovative Learning and most importantly the untold secrets of Masterful Training. How to create a training / learning environment using suggestopedia and impactful stimulation. With this powerful treasure of guide knowledge, participants will deliver impactful Presentation Skills, Learn Creative & Interactive Technology and become a highly engaging Master Trainer. Foundation of Training:This topic teaches the “how-to” review the belief system of the audience and understand the psychological influences of the brain for training effectiveness.The power to determine training outcomes becomes achievable if you can identify the training objectives and the total training concept. Synergistic Training Strategies:Essential success proven strategies and applications to create learning impact and powerful presentation. Power Communication Training:Insight into the cause behind poor engagement or communication with your audiences, and the reverse process that leads to effective communication. You will also learn the strategies to the trainer-audience relationship. 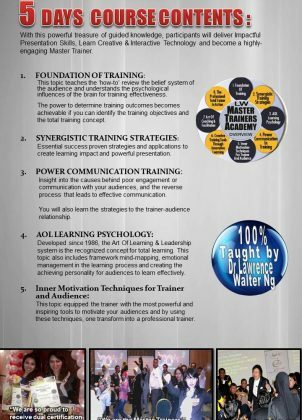 AOL Learning Psychology:Developed since 1986, the Art of Learning & Leadership system is recognized concept for total learning. This topic also includes framework mind-mapping, emotional management in the learning process and creating the achieving personality for audiences to learn effectively. Inner Motivation Techniques for Trainer and Audience:This topic equipped the trainer with the most powerful and inspiring tools to motivate your audiences and by using these techniques, one transform into a professional trainer. Creative Training Tools Through Innovative Learning:Introduced and taught to apply various simulations, games and the power of visual for creative and super learning environment that win your audiences and outperform the conventional conduct of training. Art of Influencing / Facilitation:Increase your learning effectiveness, audience participation and transformation results with various methods, skills and models that will increase audience participation, learning output as well as the transformation process. The Professional Total Trainer in Action:The ultimate that synergize the total qualities of the professional trainer to maximize total training outcomes. 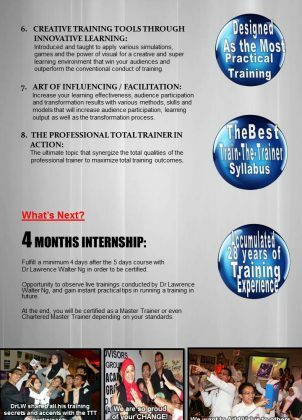 Fulfill a minimum 4 days after the 5 days course with Dr Lawrence Walter Ng in order to be certified. Opportunity to observe live training conducted by Dr Lawrence Walter Ng, and gain instant practical tips in a running a training in future. 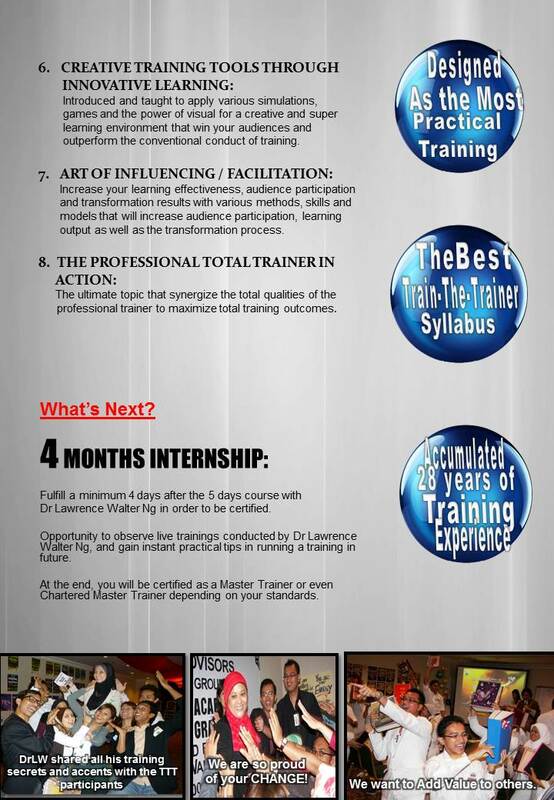 At the end, you will be certified as a Master Trainer or even Chartered Master Trainer depending on your standards. For over 28 years, Dr Lawrence Walter Ng and his team of Master Trainers & supportive ‘angels’ has brought his action-packed, high energy training seminars to over 500 companies in 10 countries around the Asia Pacific region. Now you can experienced why he is one of Asia’s top speakers & Master Trainer. You too can invite him to your company or country and allow your people to discover their hidden potential. he will give you the KEY to success that will unlock the POWER inside you. We also invite you to view his Books, listen to the interesting Audio and watch the awards-winning Videos in our unique website. Dr Lawrence Walter Ng has been described as a dynamic and inspiring motivational speakers. Through his creative presentation and humor, his audience have not only benefited tremendously from his teaching but also thoroughly enjoyed themselves. Thus, making learning interesting and effective. The impact of his lively training and concepts have generated greater energy and direction towards the challenge of excellence. Organisations and individuals have improved their performances with his training. Dr Lawrence Walter Ng has over 28 years experience in training and developing people. He was an advertising, marketing and creative consultant and began his focus on training in 1986. Since then, he has personally spoken to more than 1,000,000 participants. His unique methods of training and ideas are designed to take participants on an exciting journey of learning excellence. He has also produced an Innovative Self learning package on Corporate Excellence and Personal Self Improvement. Dr Lawrence Walter Ng also founded the concept of the Mental Warrior, an advanced workshop on Brain Power Motivation and Psychology of Success. Through his research and experience, he discovered certain patterns of excellence that produce effective results through the understanding of both positive and negative thoughts. 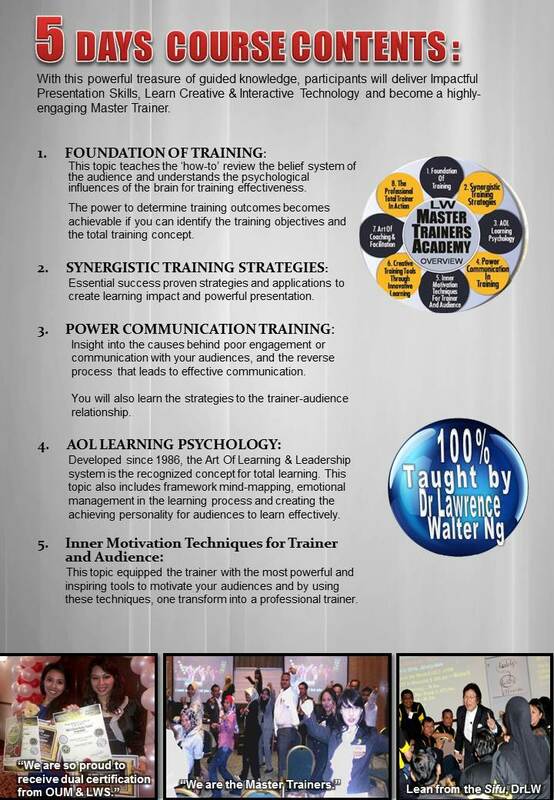 Dr Lawrence Walter Ng is one of Asia’s top speakers and Chief Master Trainers.